If you are in the market for a microSD card — be it for your smartphone, tablet, digital camera, or whatever else — we recently told you about a great deal on SanDisk's 256GB and 400GB Ultra cards. The deal is still good and it's perfect for those of you looking for a high-capacity card. If a 128GB card is something more fitting for your needs, however, wait till you see this latest deal. There's a promotion on BestBuy right now that slashes the price of the SanDisk Ultra PLUS 128GB microSD card down to just $19.99 (from $139.99). And if you're looking for an even faster solution, the SanDisk Extreme 128GB is now just $29.99 (was $269.99). The difference between the two is that the SanDisk Extreme is a little faster at reading and a lot faster at writing data. The difference is 10 dollars, which may or may not be worth it depending on what you need the card for. If you just want to add some storage to your phone or are taking primarily still shots with your camera, you may be just fine with the Ultra. If recording lots of 4K video is your thing, however, you may want to fork out the extra cash and get a SanDisk Extreme instead. Both of those are great deals. I'm thinking about a 512, but I already have a 256 in my Note 9. Maybe once they're a little cheaper. Most definitely. Thats a steal for a dub. $29.99 (was $269.99)???? $269 is way out of line for the original price! 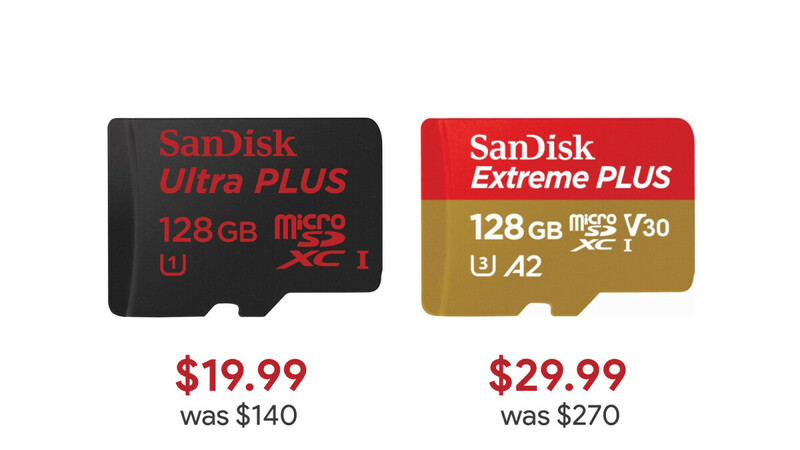 Maybe last year they were that much I buy a lot of of SD cards for my DJI drones and DSLR I haven't seem legit prices that high in a while!!!! I purchased over 20 cards in the past few months a 128 for $25 just 3 weeks ago. I wish SSD's prices could drop as fast as these MicroSD prices :-/ Been monitoring 2TB SSD price since last year, and it barely drop till now. Me too. I have now 265gb ssd and 1tb hdd in my PC and wanted to swap that ssd with 1tb to replace 500gb hdd which is so slow in my laptop with ssd from my PC but price is ridiculous.